If any of you have older kids who watch the show I Carly then you know what these are! 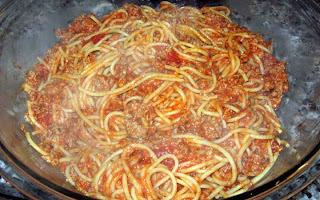 I don't know what took us so long to make them but one day Charlie just said hey, lets make spaghetti tacos! So of course the kids were all about it! 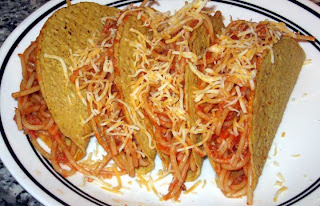 I had wanted to just do them like regular tacos, but put the spaghetti on the bottom. 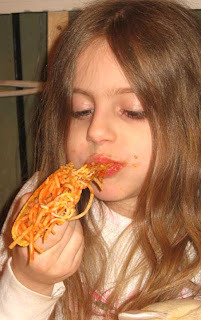 So it would have been spaghetti with tomatoes and lettuce and cheese on top etc. 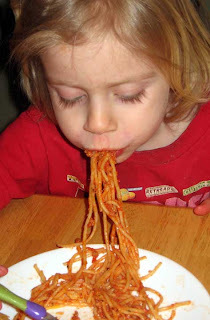 (maybe some salsa too, who knows) but Charlie thought it best to just stuff tacos with spaghetti. He was probably right, well meaning that surely the kids would prefer that. So that is what we did. 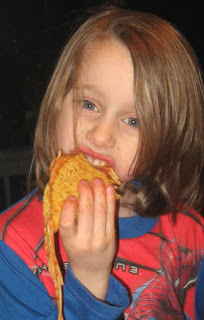 Then we took some hard taco shells and stuffed it with the pre-mixed spaghetti, and then sprinkled some cheese on top. The kids LOVED it! 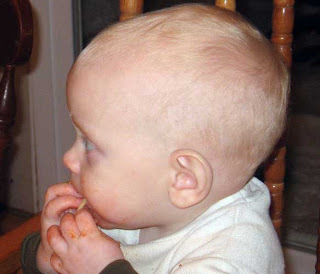 (as you can see below) It was a fun meal and it was surprisingly good. I mean it was really good! 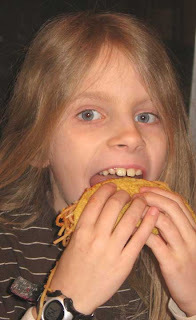 Who would have thought that spaghetti in taco shells would be so tasty! We will be making these! Great!! Y'all try it and let me know what everyone thinks.